The second quarter of 2019 is well underway, and for many, this is a time to look back at our goals and main initiatives for the year to determine whether we’re on track. It’s also a time to look forward, as many any companies may be starting to prepare reports for mid-year management meetings. The common expression, “time flies,” is no joke. Time is an unstoppable force, but that doesn’t mean it has to get away from us. 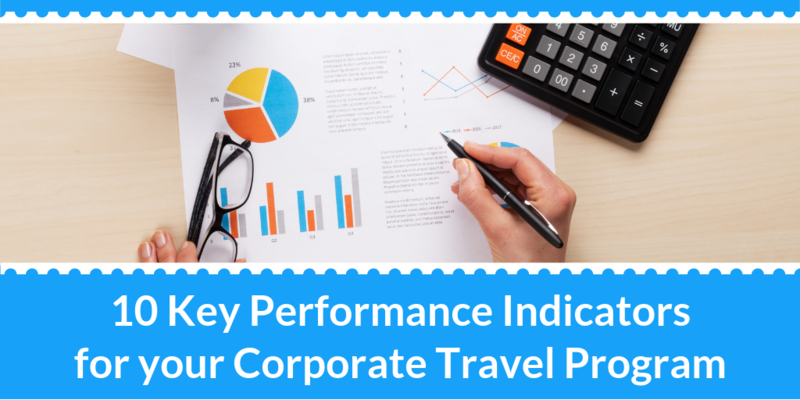 To measure your company’s progress towards its travel management goals in the here and now, it may be helpful to review relevant key performance indicators (KPIs). Analyzing travel spend is a given, but we recommend that companies dig deeper and make sure that they have a full picture (i.e. access to all global data). For example, how much is spent per country, region, or business unit/department? How concentrated is your travel spend on specific routes or cities? Understanding this information will help you plan accordingly as you grow and can also be leveraged to improve your supplier contracts. What percentage of your company’s airline tickets are booked through the online booking tool (OBT)? If most of your travelers are booking through an agent as opposed to utilizing the OBT, this may be driving up costs, as agent-assisted bookings usually require a higher service fee. Whether your travelers are booking online or with an agent, it’s important to check in with them to inquire about their experience and ask for feedback. This will help you evaluate the level of service received and how the online booking tool is functioning. It can also help you identify areas that need improvement. If you have already negotiated rates with preferred suppliers based on volume and market share, it’s time to evaluate how much these negotiated rates have saved you. To calculate, take the market rate and subtract the negotiated rate, then multiply by the total amount purchased at the negotiated rate. How much of your spend is under contract? How competitive is your contract? Plus, how are you measuring up on your promises to suppliers? Answering these questions year after year is important for maintaining an optimized relationship with your suppliers. Are you continually evaluating your programs to see if you ought to contract with additional countries? This is where the travel spend concentration comes into play, as there could be unrealized opportunities to improve your program by utilizing in-country travel management services. Many countries, like Canada, even offer lower airfare when you book the travel in country. How many of your travelers’ bookings are not only out of policy but also made outside of the approved booking channels? Sometimes travelers do go rogue thinking that they’re saving the company money, but guess what? This could be costing you more. Minimizing last-minute bookings usually results in lower airfares. Are your travelers booking far enough in advance? Need to compare your travelers’ bookings against the recommended time frame? Check out our article, “How to Reduce Travel & Expense Costs for Your Company,” to learn the best times to buy your ticket depending on the season. Along with evaluating how far in advance bookings were made, it’s also powerful to evaluate how often bookings were changed after ticketing. Ticket changes often bring additional costs, so insight into how often changes occur could allow you to determine whether non-refundable fares should be allowed within your travel policy. Please note that while non-refundable tickets are often reusable in the U.S. this is not the case in every country. Do you have access to the location information you need to be able to act quickly in the event of an emergency? To calculate, take the number of travelers you have location information on and divide that by your total number of travelers at any given time. Please remember that the above-mentioned KPIs are only a few general recommendations. If you would like to get specific suggestions from our team, or if you need assistance calculating any of the above, contact your World Travel, Inc. Account Manager or reach out to our sales team at sales@worldtravelinc.com. Are there other KPIs you would like added to this list? Feel free to share these for fellow readers in the comments below!